Srijana in Barcelona: "Update on Madrid Visit"
After being done with embassy work, we went directly to our hotel. While passing through the way in Madrid I found that Madrid is a bigger city than Barcelona. I noticed taller buildings than in Barcelona. People seemed to be in a hurry (symbolization of developed city????). It was little different for me as I have found the people in Barcelona to be more relaxing and seldom in hurry. Our destination was the zoo from the hotel. On a way we grabbed sandwich for a lunch because we didn't want to miss quality day time just eating. The zoo obviously was fascinating. The dolphin, sea lion and birds shows were amazing. The trained animals along with their masters performed their best to satisfy the visitors. We spent almost 4 hours there, our precious hours of the wedding anniversary day. But it worth a lot!!! !,really yes, because Pradeep was more than happy there. Then from there we went to the city center. Enjoyed the happenings of the city for sometime and then went for an elegant dinner (celebration of wedding anniversary). As we both were tired, we went to the hotel after having the delicious Italian dinner. As always I got up late. And then hurried up to go out to see more touristic areas in Madrid. We went to Plaza Real, Plaza Sol, Museu de Prado, Plaza Mayor and some other "must visit" places. 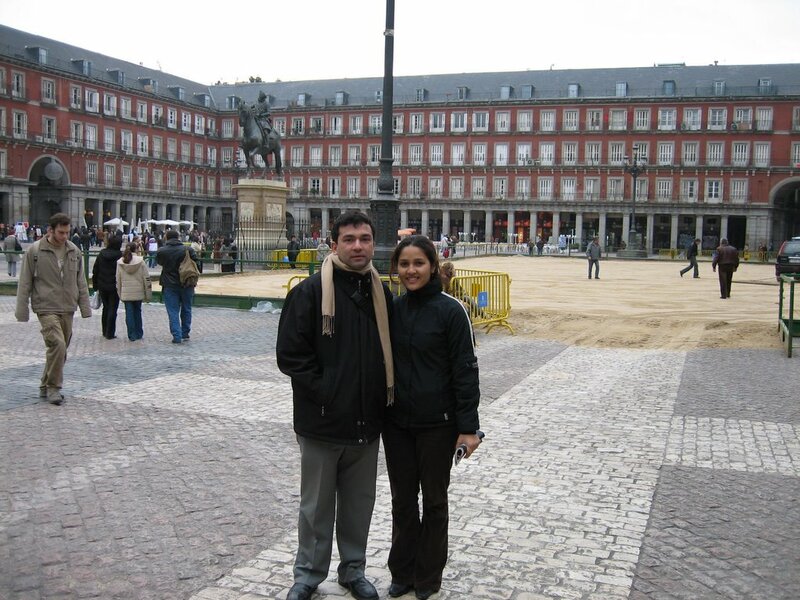 In Plaza Mayor, Pradeep and I wanted to take a photo of both of us. I saw a man coming towards our direction. Without wasting a second I asked him if he could take our photo. Then very soon I realized that he was eating some sticky sweet thing and when I asked to take photo he sucked his fingers, wiped them with his pant and grabbed our camera. Oppss... Pradeep stared at me with his big eyes. I could not do anything and with deep heart I handed my camera to him. Oh..no...he touched the screen of the camera with his same fingers. With almost no interest we posed for the photo. As soon as he was gone I could see a big patch on the screen of our camera. If possible Pradeep could have eaten me when I handed the camera to that guy. For him, the camera is so dear that he could forget me but not the camera. Within every half an hour he used to ask for the camera and now to make matters worse, the camera had marks in the display screen!!! Then after he cooled down he gave me a very cute suggestion!!! Always ask a girl ,if beautiful, even better, to take a photo...what.??? But I think I agree. Yes, girls will only handle and take care of such things better. No possibility of any dirt or patch!!!! Hey! it can be a good suggestion for you too!!! Till then it was already 6:30 pm. Now the time was to go back to hotel , pick up the luggage and then head towards the airport. The connection of the Metro to the airport was very convenient. The Metro stop was the airport itself. I found it very comfortable because in Barcelona if we take a train to go to airport we need to change two trains from our place and then a bus inside airport which is a hassle for passengers with heavy baggages. Your written english has improved by leaps and bounds. Amazing! I enjoy reading your blogs a lot. Though late, let me wish you belated first wedding anniversary. I know you two had a wonderful time. My good wishes will always be with you. Be happy always. And yes I didn't know that 'Camera' is so dear to Pradeep than Srijana. Otherwise I thought that I was the only such species who takes things that way ;). But Srijana, don't get jealous it's just a camera ni. Anyway, I like Pradeep's cute suggestion he..he..but I don't agree that only GIRLS will handle and take care of such things better. Ani what about this Jiten ni. Okay I am in quick, will catch you later hai ta.